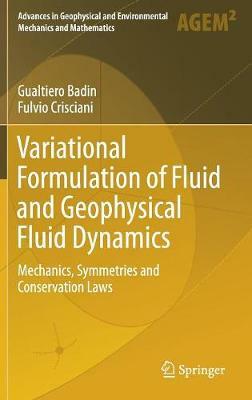 This book describes the derivation of the equations of motion of fluids as well as the dynamics of ocean and atmospheric currents on both large and small scales through the use of variational methods. In this way the equations of Fluid and Geophysical Fluid Dynamics are re-derived making use of a unifying principle, that is Hamilton's Principle of Least Action. The equations are analyzed within the framework of Lagrangian and Hamiltonian mechanics for continuous systems. The analysis of the equations' symmetries and the resulting conservation laws, from Noether's Theorem, represent the core of the description. Central to this work is the analysis of particle relabeling symmetry, which is unique for fluid dynamics and results in the conservation of potential vorticity. Different special approximations and relations, ranging from the semi-geostrophic approximation to the conservation of wave activity, are derived and analyzed. Thanks to a complete derivation of all relationships, this book is accessible for students at both undergraduate and graduate levels, as well for researchers. Students of theoretical physics and applied mathematics will recognize the existence of theoretical challenges behind the applied field of Geophysical Fluid Dynamics, while students of applied physics, meteorology and oceanography will be able to find and appreciate the fundamental relationships behind equations in this field.